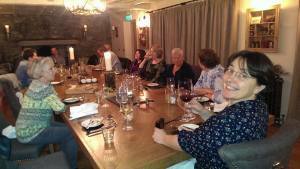 There is a fantastic new room at The Wild Boar which we dined in on the last course – wonderfully welcoming! I suspect that you get many emails from people saying what a great time they had. Well please allow me to be the latest. The day was excellent. Informative and enjoyable in equal measure. I have not stopped talking about it and must confess to becoming a smoking bore!! You will see a picture of Bobby the boiler. 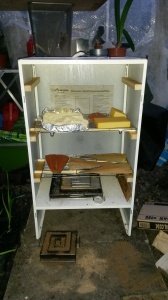 Recently finished his life as a central heating boiler and with a few well placed self tapping screws and some hardboard he has now found a new lease of life as a cold smoking cabinet. This is his first outing. We have successfully smoked some salmon and haddock fillets along with flour and a couple of generous blocks of cheese. The haddock has made some wonderful fishcakes and the salmon found its way into a risotto. The flour will soon become the first mince pies of the season and the cheese just enjoyed for its own sake. Once again thank you for a great day and the start of a whole new way of enjoying food.